Gabriel Said Reynolds is Professor of Islamic Studies and Theology at the University of Notre Dame. He is the author of The Qur’ān and Its Biblical Subtext (London : Routledge, 2010) and The Qur’ān in Conversation with the Bible : The Qur’ān Translation of Ali Quli Qaraʾi annotated with Biblical Texts and Commentary by Gabriel Said Reynolds (New Haven : Yale University Press, forthcoming 2016). Tommaso Tesei is Polonsky Fellow at the Van Leer Jerusalem Institute and author of “The Prophecy of Ḏū-l-Qarnayn (Q 18:83–102) and the Origins of the Qurʾānic Corpus,” Miscellanea arabica 2013–2014, 273–90, and “Some Cosmological Notions from Late Antiquity in Q 18:60–65 : The Quran in Light of Its Cultural Context,” Journal of the American Oriental Society 135.1 (2015), 19–32. Hamza M. Zafer is Assistant Professor of Early Islam and Classical Arabic Near Eastern Languages and Civilizations Comparative Religion / Jewish Studies at the University of Washington. 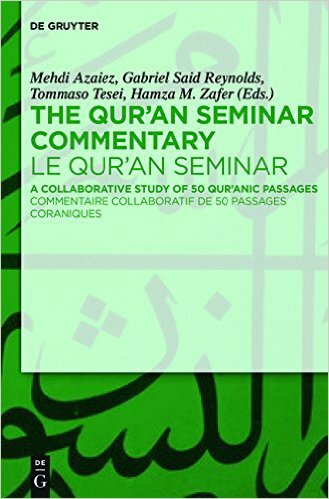 The Qurʾan Seminar Commentary is an unprecedented work of collaboration in the field of Qurʾanic Studies, involving the insights of 27 different scholars on 50 different Qurʾanic passages. These scholars represent a diverse range disciplinary backgrounds (Arabic language, comparative Semitic linguistics, paleography, epigraphy, history, rhetorical theory, hermeneutics, and Biblical studies) and provide readers with unique insight into the latest trends of research in the Qurʾan. The Qurʾan Seminar Commentary will be a useful and illuminating reference work for students and scholars alike in the field of Qurʾanic Studies.